Nanopositioning is the science and engineering of moving and sensing the position of tools, objects, and matter at the nanometer scale. The ultimate goal is to do so with the highest precision, accuracy, and speed as possible. One nanometer is one billionth of a meter, which is a small unit of length. How small is this? Consider the marble and Earth example. If the Earth (with a diameter of approximately 12,756 km) was scaled to 1 meter, then a normal-sized object on Earth such as a marble would be representative of 1 nanometer. Experts often argue over what constitutes as ‘nanotechnology’, but in general most would agree that it’s dealing with anything measuring between 1 and 100 nanometers (nm). Larger than that is the microscale, and smaller than that is the atomic scale. 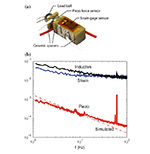 Sensing technologies for measuring the motion of nanopositioning stages. Much of our work relates to creating high-speed high-precision nanopositioning platforms for scanning probe microscopes (SPMs) and related technologies. ASME Dynamic Systems and Control Conference (DSCC), Park City, Utah, October 8-11, 2019 (Under review), 2019. IEEE/ASME Trans. on Mechatronics (Under review), 2019. American Control Conference (Accepted, forthcoming), Invited session: Precision Mechatronics, Philadelphia, PA, July 10-12, 2019, 2019.
International Journal of Intelligent Robotics and Applications, 2 (4), pp. 425-435, 2018. ASME Dynamic Systems and Control Conference (DSCC), Tysons Corner, Virginia, USA, October 11-13, 2107 at the Sheraton Tysons Hotel in Tysons Corner, Virginia, 2017. Invited session on Design & Control of Micro/Nano Precision Mechatronic Systems, IEEE Int. Conf. on Advanced Intelligent Mechatronics, Munich, Germany, July 3-7, 2017, 2017. Biophysical Society Annual Meeting, Los Angeles, CA, February 27 - March 2. Poster presentation., 2016. American Control Conference (Accepted), Boston MA, July 6-8, 2016, 2016. Ru, C; Liu, X; Sun, Y (Ed. ): Fundamentals and Applications of Nanopositioning Technologies, Springer, 2016. C. Ru X. Liu, ; Sun, Y (Ed. ): Fundamentals and Applications of Nanopositioning Technologies (Under review), Springer, 2016. Ru, C; Liu, X; Sun, Y (Ed. ): Springer, 2016. Mechatronics, Frontiers in Mechanical Engineering, 1 , pp. Article 14, 2015. Mechatronics, 30 , pp. 231–243, 2015. Springer, New York, 2014, ISBN: 3319066161.
Review of Scientific Instruments, 85 (4), pp. 045003 (6 pages), 2014. 19th World Congress of the International Federation of Automatic Control, 24-29 August 2014, Cape Town, South Africa (Forthcoming), 2014. IEEE Control Systems Magazine (In press), Special Issue on Dynamics and Control of Micro and Naoscale Systems, 33 (6), pp. 86 – 105, 2013. Automatica, 48 (8), pp. 1751 – 1758, 2012. IEEE Cont. Syst. Mag., 32 (1), pp. 66–68, 2012. IEEE/ASME Trans. Mechatronics, 17 (2), pp. 356 – 369, 2012. Mechatronics, 22 , pp. 271 – 281, 2012. IEEE International Conference on Robotics and Automation (ICRA), 2012.
Review of Scientific Instruments, 83 (12), pp. 121101, 2012. Seeing at the Nanoscale 2012, 2012. IEEE Control and Decision Conference, 2012. Univesity of Nevada, Reno, 2011. Rev. Sci. Instr., 82 , pp. 123703, 2011. ASME Conference on Smart Materials, Adaptive Structures and Intelligent Systems (SMASIS), 2011. Ultramicroscopy, 110 (9), pp. 1205 – 1214, 2010. American Control Conference, Special Invited Session on Advances in Actuation for Nanopositioning and Scanning Probe Systems, pp. 4949 – 4956, 2010. IFAC Symposium on Mechatronic Systems and ASME Dynamic Systems and Control Conference (DSCC), Invited session on Micro- and Nanoscale Dynamics and Control, 2010. Sensors and Actuators: A. Physical, 161 (1-2), pp. 256 – 265, 2010. IEEE International Conference on Robotics and Automation (ICRA2010), Invited workshop, May 3-8, 2010. American Control Conference, Special Invited Session on Advances in Actuation for Nanopositioning and Scanning Probe Systems, pp. 4975 – 4980, 2010. American Control Conference, Invited Session on Advances in Control of Nanopositioning and SPM Systems, pp. 301 - 306, 2009. ASME J. Dyn. Syst. Meas. and Cont., 131 (6), pp. 061101 (19 pages), 2009. ASME J. Dyn. Syst. Meas. and Cont., 131 , pp. 061103 (12 pages), 2009. IEEE Cont. Syst. Mag., Special Issue on Hysteresis, 29 (1), pp. 70 – 82, 2009. Asian Journal of Control, Special issue on Advanced Control Methods for Scanning Probe Microscopy Research and Techniques, 11 (2), pp. 144 – 153, 2009. Ultramicroscopy, 108 , pp. 1551–1557, 2008. ASME Dynamic Systems and Control Conference, Invited Session on Dynamics Modeling and Control of Smart Actuators, pp. 1325 – 1332, 2008. American Control Conference, Invited session on Advanced Mechanism Design, Modeling, and Control of SPMs, pp. 2028 – 2033, 2008. American Control Conference, Invited Session on Modeling and Control of SPM, pp. 3188 – 3193, 2008. 17th IFAC World Congress, Invited Session on Dynamics and Control of Micro- and Nanoscale Systems, 2008. IEEE/ASME Trans. on Mechatronics, 13 (6), pp. 700 – 709, 2008. IEEE Trans. Cont. Syst. Tech., 15 (5), pp. 927 – 935, 2007. In this brief, we study the design of a feedback and feedforward controller to compensate for creep, hysteresis, and vibration effects in an experimental piezoactuator system. First, we linearize the nonlinear dynamics of the piezoactuator by accounting for the hysteresis (as well as creep) using high-gain feedback control. Next, we model the linear vibrational dynamics and then invert the model to find a feedforward input to account vibration -- this process is significantly easier than considering the complete nonlinear dynamics (which combines hysteresis and vibration effects). Afterwards, the feedforward input is augmented to the feedback-linearized system to achieve high-precision high-speed positioning. We apply the method to a piezoscanner used in an experimental atomic force microscope to demonstrate the method’s effectiveness and we show significant reduction of both the maximum and root-mean-square tracking error. For example, high-gain feedback control compensates for hysteresis and creep effects, and in our case, it reduces the maximum error (compared to the uncompensated case) by over 90%. Then, at relatively high scan rates, the performance of the feedback controlled system can be improved by over 75% (i.e., reduction of maximum error) when the inversion-based feedforward input is integrated with the high-gain feedback controlled system. Mechatronics, 16 (3--4), pp. 141 – 158, 2006. Asian Journal of Control, Special issue on Advances in Nanotechnology Control, 6 (2), pp. 164-178, 2004. The 3rd IFAC Symposium on Mechatronic Systems, 2004. IEEE 42nd Conference on Decision and Controls, Invited session on Nanotechnology: Control Needs and Related Perspectives, pp. 2626 - 2631, 2003. The 2nd IFAC Conference on Mechatronic Systems, Invited session on Smart Materials and Structures, pp. 283-289, 2002.